Please note: We welcome fans to see Cheech and Chong’s Up in Smoke Comedy Concert, which includes sketches, original songs, storytelling, and stand-up comedy. However, please be advised that per The Capitol Theatre policy, NO SMOKING or use of electronic cigarettes or vapes will be permitted inside the Theatre, and violators of this policy will be ejected. Best known as one half of the hilariously irreverent, satirical, counter-culture, no-holds-barred duo Cheech and Chong (now back on tour), Cheech Marin is a paradox in the world of entertainment. Cheech is an actor, director, writer, musician, art collector, and humanitarian, a man who has enough talent, humor, and intelligence to do just about anything. He is truly a multi-generational star. To this day, Cheech and Chong films remain the number one weekend video rentals, and Cheech is widely acknowledged as a cultural icon. Cheech (real name Richard) Marin was born in South Central Los Angeles and met Tommy Chong in Vancouver, British Columbia as a political refugee. The duo moved back to Los Angeles and proved entertainment gold. Six of their albums went gold, four were nominated for Grammys, and Los Cochinos won the 1973 Grammy for Best Comedy Recording. The critically acclaimed duo made a fluid transition to films, starring in eight features together. During a split with Chong, Cheech wrote, directed, and starred in the comedy Born In East L.A.. He has appeared in over 20 films, including his scene-stealing role in Tin Cup . On television, Cheech was a sitcom regular before joining Don Johnson on the highly successful CBS drama, Nash Bridges (1996-2001). He later had a recurring role on the hit NBC show, Lost, and recent guest stints on Rob and Jane the Virgin. In 2009, everyone’s favorite duo reunited after 25 years apart for a national and international comedy tour, the Lights Out Tour, selling out everywhere. They also shot a full length live comedy film Hey Watch This in 2010. 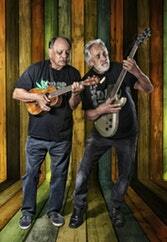 The Get It Legal Tour followed, and they are now on the Cheech & Chong: A Joint Venture Tour. Cheech is a favorite with children around the world through his many roles in animated movies and music projects, including Oliver & Company, The Lion King, Cars, and Cars 2. Cheech contributes a lot of time and energy to promoting Chicano art. Since the mid-1980s, he has amassed a renowned private collection of Chicano art, the largest in North America. He will also be the brand ambassador for a new line of mescal, Tres Papalote. Cheech is a nationally ranked golfer, active in the charity circuit. Married to Russian-born classical pianist, Natasha Marin, the couple resides in Pacific Palisades, CA. To learn more, visit www.CheechMarin.com. Grammy Award winning comedian Tommy Chong is legendary for his invaluable contribution to American counter-culture as part of the iconic comedy duo Cheech & Chong. During their reign, the twosome recorded six gold comedy albums, including the 1973 Grammy winner “Los Cochinos,” and starred in eight films, most of which Chong co-wrote and directed. Tommy began his entertainment career as a musician in a Canadian-based rhythm and blues band. Eventually, he landed a gig with the “Vancouvers”” and co-wrote the band’s 1960’s hit, “Does Your Mama Know About Me.”” From here, Chong eventually turned towards the life as an actor. Tommy has appeared in several films including 1990’s “FAR OUT MAN! and NATIONAL LAMPOON’S SENIOR TRIP (1995). Chong has also starred, most notably, as “Leo” on FOX’S “That 70’s Show,” and has guest starred on ABC’s “Dharma & Greg” and “The George Lopez Show.” Chong recently released his new book entitled Cheech and Chong: The Unauthorized Autobiography about the exploits of the infamous duo’s smoke-filled world. Earlier this year, the highly anticipated, award winning documentary A/K/A TOMMY CHONG was released worldwide. The documentary features the journey that Chong took after a fully armed SWAT team raided the comedian’s home in February of 2003. In 2014 Tommy lit up the dance floor as a contestant on ABC’s “Dancing With The Stars” and was paired with pro dancer Peta Murgatroyd. Tommy reunited with his old comedy partner Richard “Cheech” Martin, and they are now touring with the “Cheech & Chong: Light Up America & Canada” tour which has proven to be one of the most successful comedy tours of the year, selling out multiple shows from coast to coast. Tommy is also gearing up for the premiere of his online talk show “Almost Legal With Tommy Chong” set to come out on Friday, October 23rd. After battling and defeating prostate cancer, Tommy released a statement in June of 2015 stating that he has now been diagnosed with rectal cancer and is seeking ongoing treatments with the help of various therapies, including hemp oil. Never one to give up on a fight, Tommy is an avid speaker and pro activist for the medical wonders and potential health benefits of using marijuana.